Note: This blog post article is the eleventh in a series of twelve articles on musculoskeletal conditions of the low back (lumbar spine) and pelvis. For the rest of the articles in the series, scroll to the end of this article. Figure 25. Facet syndrome is caused by excessive physical stress on the facets. Permission Joseph E. Muscolino. Manual Therapy for the Low Back and Pelvis – A Clinical Orthopedic Approach. 2015. As described in its name, facet syndrome is a condition of the facet joints of the spine. Disc joints and facet joints each have their own functional role within the spine. As a rule, disc joints bear weight and facet joints guide motion. When excessive compression force is placed upon the lumbar facet joints, they can become irritated and painful. The resulting condition is termed facet syndrome. Facet syndrome can occur for a number of reasons. Common among them is excessive time spent in a posture of extension or motions into extension because extension transfers weight bearing from the anteriorly located discs to the posteriorly located facets (Fig. 25). Having an increased anterior pelvic tilt with a compensatory hyperlordotic lumbar spine (see previous section) is a major predisposing factor for this condition. 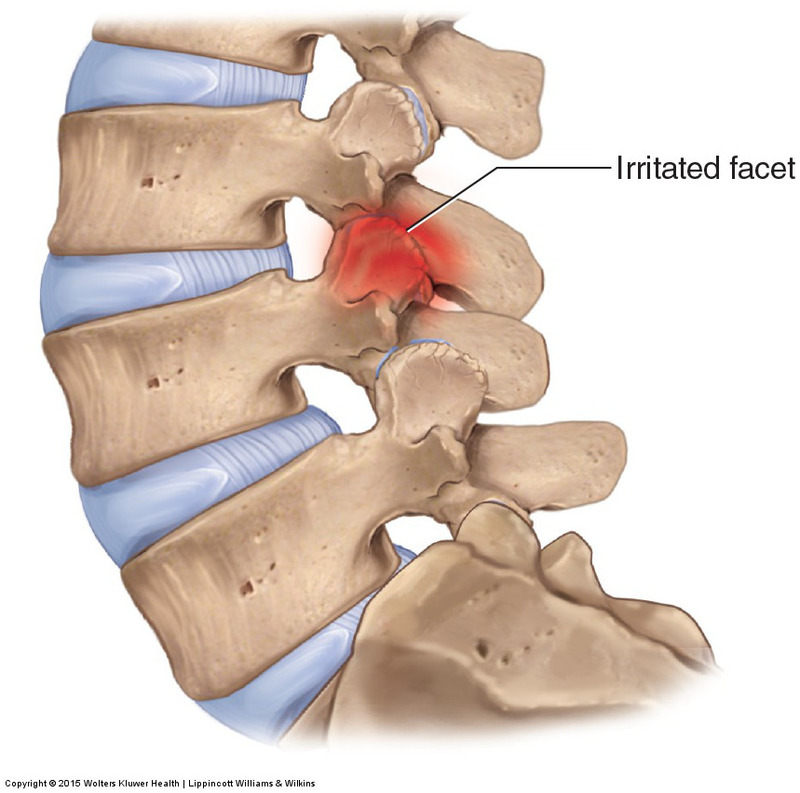 Facet syndrome is extremely easy to assess because lumbar extension range of motion will reproduce the client’s pain. Although facet syndrome is an irritation/inflammation of the articular surfaces of the lumbar facets, it is usually accompanied by spasming/hypertonicity of the paraspinal musculature. This muscle tightening can then add to the client’s pain. Facet syndrome is extremely simple to assess. Have the client move his or her lumbar spine into extension. If there is no pain, he or she does not have facet syndrome. If he or she has facet syndrome, this motion will reproduce low back pain (of course, it should be kept in mind that pain resulting from lumbar extension can also be caused by other conditions). Moist heat, massage, and stretching can all be very beneficial for clients with facet syndrome. The primary focus for the manual therapist is to counsel the client on decreasing the causes of the condition, usually excessive postures and motions into extension. Also important is to relax the concomitant muscle spasming that usually accompanies the facet joint irritation. This blog post article is the eleventh in a series of twelve articles on musculoskeletal conditions of the low back (lumbar spine) and pelvis.